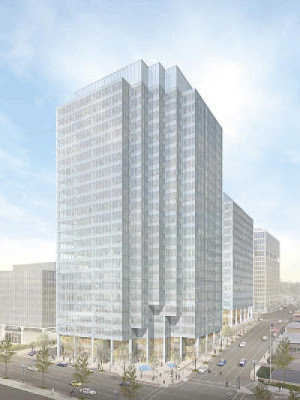 Everyone has heard that Centene is returning to their original plan to build in Clayton after playing Downtown St. Louis so that Clayton would cave-in and agree to unprecedented subsidies to lure them back. 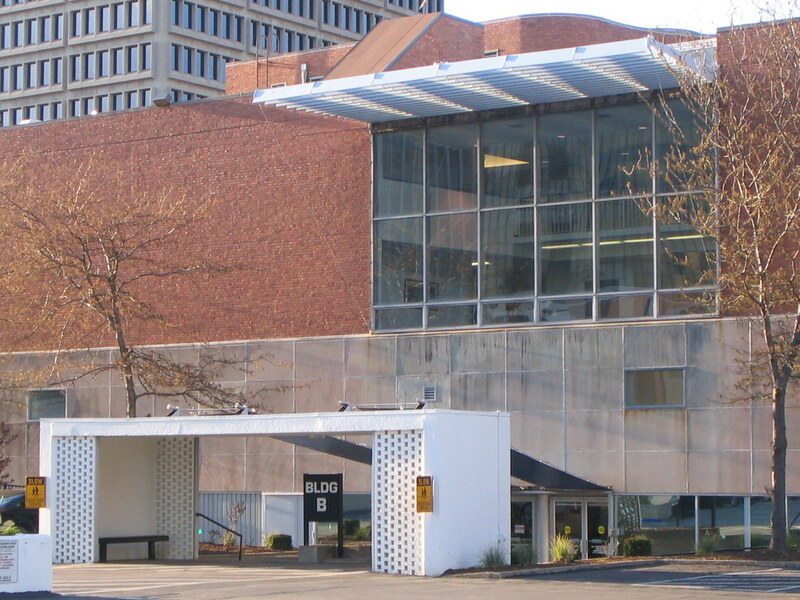 What seems to have missed the radar is that Harris Armstrong's unique Scruggs Vandervoort Barney aka the Library Limited building could have been saved at least for several years had it not been for the complete ignorance of the City of Clayton's politicians. My suspicions were confirmed in an article in last weeks West End Word stating that at least temporarily, the historic Harris Armstrong building was going to be spared. Under a revised plan, Centene was going to build a tower at the corner of Carondelet and Hanley first, while leaving the Harris Armstrong building standing for "temporary offices". The phase two second shorter tower at the corner of Forsyth & Hanley would be built at an "unspecified date in the future, dependant on market conditions". In others words, it may never have happened. It is unclear if Centene would have kept the Harris Armstrong building standing after construction was complete on the first tower, but they would have no real reason to demolish it until they planned to built on the site. They paid $12 million for the building and garage behind, so they might as well lease it out the building and get some revenue from it until the uncertain phase two, right? Unfortunately, the City of Clayton demanded that the first tower go up on the corner of Forsyth and Hanley, triggering a demolition of the historic building this summer. Their concern is for revitalization of Forsyth. 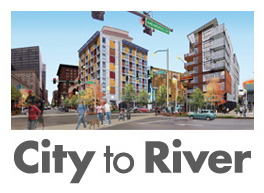 If Clayton was so concerned about Forsyth, they would have long ago created a master plan for active mixed use redevelopment of the street from the Parkway to Bemiston. 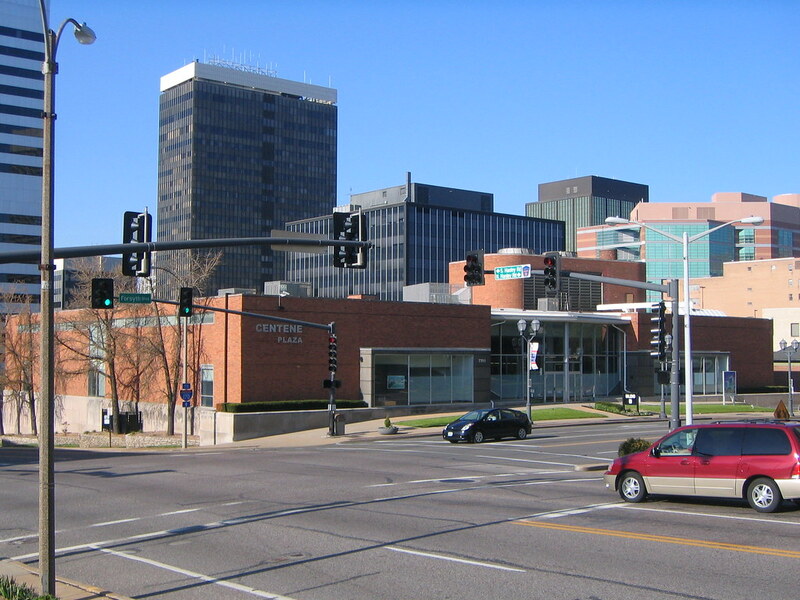 Instead, they have sat and watched what was the premier retail street in St. Louis County become a series of vacant lots and underutilized properties characterized by inactive (non-retail) uses on the ground floors. At the same time, development of the former "Clayton hole" has moved the center of gravity one block south to Carondelet. A new tower with retail at Hanley and Carondelet would have nicely tied what is an isolated area with the core of downtown Clayton. Saturday night I was browsing the St. Louis Views section of the Mercantile Library collection at UMSL, and came across this aerial image of Downtown St. Louis pre-1940. 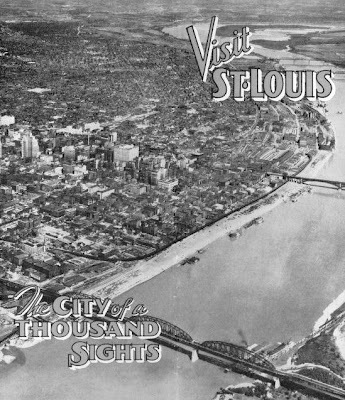 The photo was actually a cover for a promotional brochure tempting readers to "Visit St. Louis - The City of a Thousand Sights". 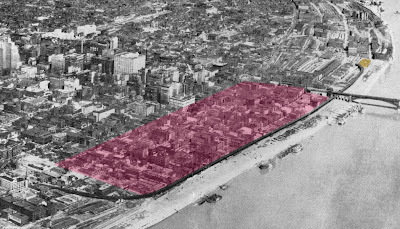 The photo shows the historic riverfront district prior to its clearance for the arch grounds (area shaded red). 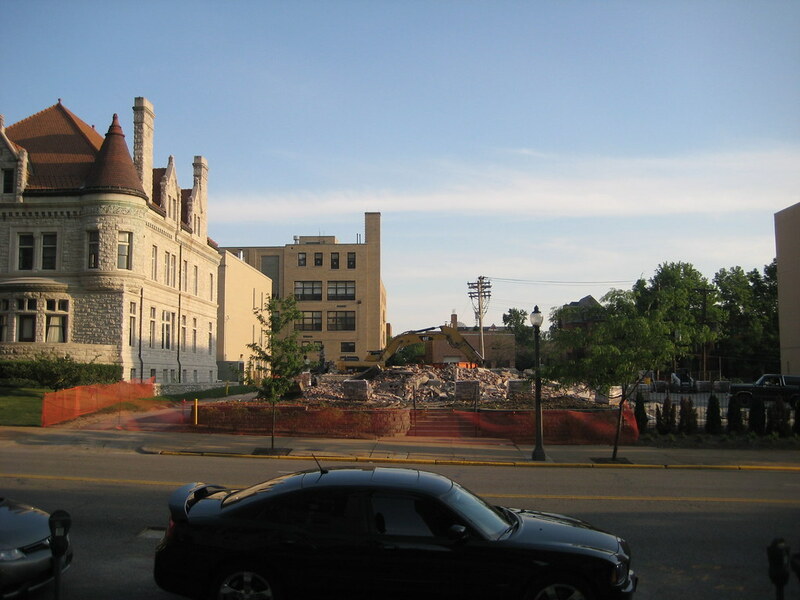 Hundreds of buildings on covering 36 blocks were demolished beginning in 1940. The same photo shows the few surviving riverfront warehouses (shaded orange) in the 1100 block of Leonor K. Sullivan that LCRA seems hell bent upon demolishing. The same night I happened to catch the original 1960 version of Phycho. 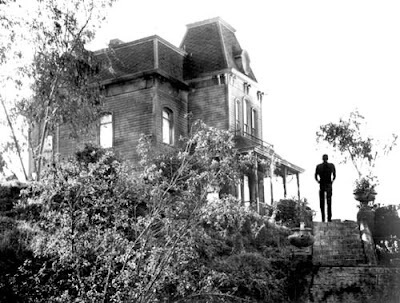 I could not help being amused by the large Victorian mansion up the hill from the Bates Motel portrayed as the stereotypical "scary house". This was not by accident, as the prevailing thought at that time was that these dark old Victorians were outdated and obsolete and that they should be cleared for new modern structures in the name of "progress". Victoran homes, like the one that SLU is poised to destroy at 3740 Lindell, are a rarity in Midtown now because hundreds of them were demolished for the Mill Creek Valley Urban Renewal Project. Is it 1960 again on SLU's campus? 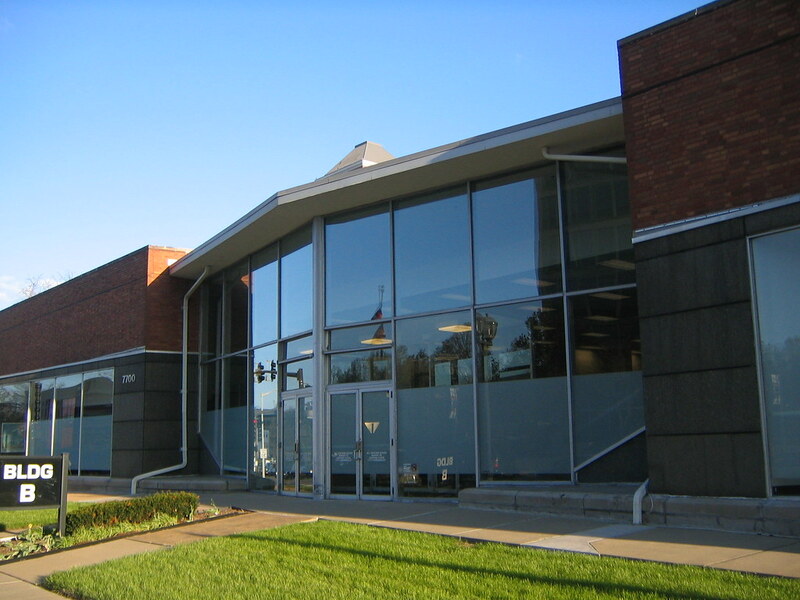 No, if that were the case, SLU would not have recently contemplated "updating" (destroying) the almost mint condition Pius Library (not sure if this was or is going to be implemented). Arbitrary stylistic judgements have been made though on both fronts and could result in the loss of architectural history from two distinct periods of time.